As we know, Escape Room is the great game to play. It invites you to solve the mazes and find the escape route. If you want to get different experiences of enjoying the Escape Room, there is a great movie released next year. It has the same title as the game. As its name, this movie is about the maze and how players have to escape and find the way out. However, this is not just a family movie. It will bring thrill, adrenaline, fear, and excitements during the whole movie. This is going to be released at the beginning of 2019. 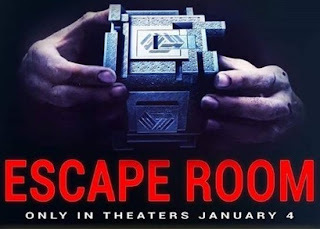 For now, let's check the Escape Room (2019) movie synopsis and official trailer. 2019 is coming and there are many great movies. Escape Room will be one of the nice options if you love thriller and mind-game genre. This movie offers great sensation and brings you into the real maze, where life is the bet. Those who cannot solve and find the clues will die. This is surely going to be a great movie to wait. Talking about Escape Room (2019) movie synopsis and official trailer, the story is about 6 invited people. They are invited to play the Escape Room. However, it is not going to be a common game since the invited players can lose their life if they cannot succeed in each of the mazes. Based on the official trailer, some scenes show that 6 people get a package. The package is sent to each of them and its form is like a puzzle cube. Each of the cubes is designed differently and they are challenged to solve the puzzle. All of them can solve it and they get a card that looks like an invitation. Then, they are gathered into a location based on the clue found in a puzzle box. This is how the game of Escape Room is started. In addition, many thrilling mazes must be solved by them in order to survive. Those who are invited to the game have different backgrounds. These six peoples are Zoey, Ben, Amanda Harper, Mike, Jason, and Danny. The character of Zoey is played by Taylor Russell, Ben by Logan Miller, and Amanda Harper by Deborah Ann Woll. Then, Tyler Labine plays as Mike, Nik Dodani as Danny, and Jay Ellis as Jason. All of them have a different background of profession and ages, so this movie also brings psychological aspect in the storyline. Moreover, this movie offers a good storyline that will invite you to feel the adrenaline. The effect supports the mazes and puzzles. Technology is involved to bring good effects, including in making a set of the escape rooms. During production, the movie has passed some long steps and stories. Based on the information of Escape Room (2019) movie synopsis and official trailer, it was first titled as The Maze and going to be released in 2017. However, some changes happen during the production process until the official trailer is released in October 2018.